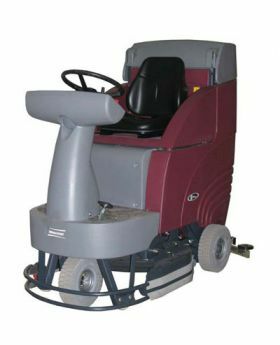 The E Ride 30 is a new Rider Scrubber from Minuteman International. This rider scrubber is equipped with Aqua-Stop and has green clean features. The ERide 30 has a 30" cleaning path that cleans up to 51,666 square feet per hour. Its sleek design allows the operator to see the area that needs to be cleaned without any interference. The control panel is clearly laid out for the ease of operation.